Rising 12 storeys, Escada is home to just 111 apartments placing it amongst the very few boutique living opportunities available in Mascot. Escada is destined to be one of the most alluring buildings in Mascot, bringing a new standard of luxury boutique living to this thriving hub. From your stylish apartment, complete with the latest European fixtures and fittings, enjoy rare, never-to-be-built-out views north-east toward the Sydney CBD skyline and to the east and over the district towards Botany Bay. These unconstrained vistas amplify the oversized layouts, ranging up to 107m2 internally, and create an uplifting backdrop for the diverse range of one, two and three-bedroom apartments within. Positioned less than 5km from Sydney CBD and the domestic and international airports, Mascot is a vibrant lifestyle hub where the culinary and retail scene is one of Sydney’s most visited hotspots. Warehouses and corner stores have been transformed into bakers and cafes while the new town centre at Meriton Retail Precinct - Mascot Central places village shopping a short stroll from home. Escada is just a 400m walk to Mascot Train Station where the CBD is a mere 8 minute train ride away with only 2 stops to Central Station. Across the road from Mascot Oval, Escada places you at the heart of Sydney life. Breathtaking views with approximately 30% of apartments capturing north-eastern glimpses of the Sydney CBD skyline and never-to-be-built-out southern and eastern aspects with district views from level six upward and Botany Bay water views from level eight upward. Direct lift access to each level and comprehensive security network including apartment intercom. Rising 12 storeys, Escada is home to just 111 apartments placing it amongst the very few boutique living opportunities available in Mascot. 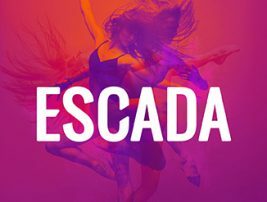 The striking design, skillfully created by renowned architects DKO, ensures Escada will be one of Mascot’s most iconic buildings, drawing inspiration from the vibrant inner-city setting and people’s growing desire for naturally-inspired luxury living environments. 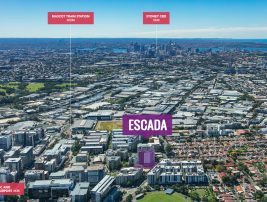 With numerous top performing schools and universities within a 5 kilometre radius, such as Sydney University, Newington College and Sydney Girls High School, and the local primary school just a few minutes’ walk from home, Escada is the perfect setting for both families and young professionals. Meriton’s brand new 5,000sqm retail development, Mascot Central, is just an 450m walk from Escada. Featuring a Woolworths and 16 food and lifestyle speciality retailers, this alfresco retail village has been designed as the local shopping hub for Mascot’s rapidly expanding community.